He looks so happy! And, red suits perfectly on him! Oh this made me cackle! I love him, he looks like the monopoly guy, only more adorable. He looks like fun, I like the tattoo just peeking out of his sleeve (right hand). I think he was a pirate. And let’s hear it for piping! This has set me to wondering whether there’s a gene or two for extraordinary color sense, which only about twelve people on the planet possess. oh wow. this has got to be one of my favorite sartorialist photos ever. i love the subtle pattern contrasts, the red in his jacket, but most of all i love his demeanor. one of my favourites of yours. only a european eccentric could pull this off with such flair and class. i wish men this side of the pond had the guts to look like this! What a story you’ve captured here. Even aside from the boldness of his red and his ingenius choice of patterns (muted by their modest showing of course), there’s more to him than meets the eye. I wonder about that tattoo peeking from under his sleeve, for example. Wonderful shot. This guy made me smile today. I like the style of the frames of his glasses, but it looks like the sides (arms? )should be longer to reach his ears just as they begin to turn downward (and not before they reach his ears). The pants and jacket are dashing together, and I like the pocket square, but the sweater is giving me an overdose of red, and the combination of the shirt and tie drive the outfit over the top. I think the outfit would be more successful if he used a charcoal/black sweater and a white shirt. I love the smile, but the moustache would be so much more flattering if it were trimmed a bit. Seriously, Sart, where do you FIND these people? They are extraordinary. There has been some dissing on this site in the past couple of days but from my perspective the past few days have been an amazing purple patch of what look to be rather remarkable human beings (who happen to be wearing great clothes too). I am blown away by the inclusivity of your vision. This is wonderful and whimsical, but seems absolutely genuine and personality-driven: a real sense of style. Love the mustache. Below, The Charmer, Milano…costume. You got name-check in the Times. Good on ya! Love this picture. Great outfit, AND you captured his personality. I bet this is a man who laughs, and inspires laughter, most of his days. I dreamt I was a damsel in distress and HE rescued me from a perilless life of PINK! I think there are very few “looks” that can pull of such a use of the Red color, and this guy has it. I love the red accents on the jacket but something about the jacket itself bothers me (dut, design?). His pocket square is awesome at a distance although maybe a little too much pink up close. That man looks like a cartoon. In a good way. Love, love, love this. Madcap, crazy but beautifully thought through – there’s nothing left to chance here! I wish I knew him. I’m just back from Rome where every man looks as though he’s going to a funeral – this gent would blow their (OK, black, silk) socks off! I love the contrasting colors. But more than anything, I love his smile! With carnival upcoming, this gentleman surely inspires me. When I dress like him, I will show off during the Brabant (southern province of the Netherlands) carnival days. Because of the costume, I will get lots of compliments by all the other beer drinking party people. Cheers! He is like the perfect real-life version of an adorable cartoon Grandpa. Not to sound weird, but he is really somebody you’d like to touch … twirl his puffy ‘stache, play with his adorably oversized ears, brush the lint from his wool blazer … a great throwback to a time and a way of dress seemingly forgotten. Pictures like these demonstrate that the best style comes through a person’s clothes but start with his character. adorable old man, though a little bit too much red, huh? Or maybe perhaps that is the thing with his outfit. this is awesome! I love the attention given to details. Wonderful photo, Sart! Really well done. I love this gentleman’s sport coat with red piping. It looks like a more daring version of the colourful club blazers we used to wear at Henley regatta. Not everything about this gentleman’s kit is to my liking. There is way too much red going on here. However, I can see how his cropped haircut, retro specs, moustache, and thick cigar might appeal to a certain segment of your readership. I suppose it could be worse. At least he’s not flashing gang signs. Come on Sart,this isn´t funny. I´m still waiting for some nice pictures. I like the paisley tie against the narrowly striped shirt. The patterns don’t clash but bring out the color and pull the eye from the more severe blocks of the jacket/pants. And, who can’t love a grandpa with a giant cigar, moustache, and funny round 1930s scientist glasses. The richness of this color combination is certainly not for the faint of heart: I doubt that I could pull it of myself without feeling, regrettably, like a bit of a caricature. For this man, however, the ostentatiousness of the ensemble works. It looks as though the bowtie is cut from the same fabric as his shirt… Or it is just that impeccably coordinated. What a fun gent! I’d like to sit with him, have a mojito and “discuss” the passersby. Buy that man a drink! So happy to see some humor and style meshing like this. Smoke em if you got em. This look is classic! 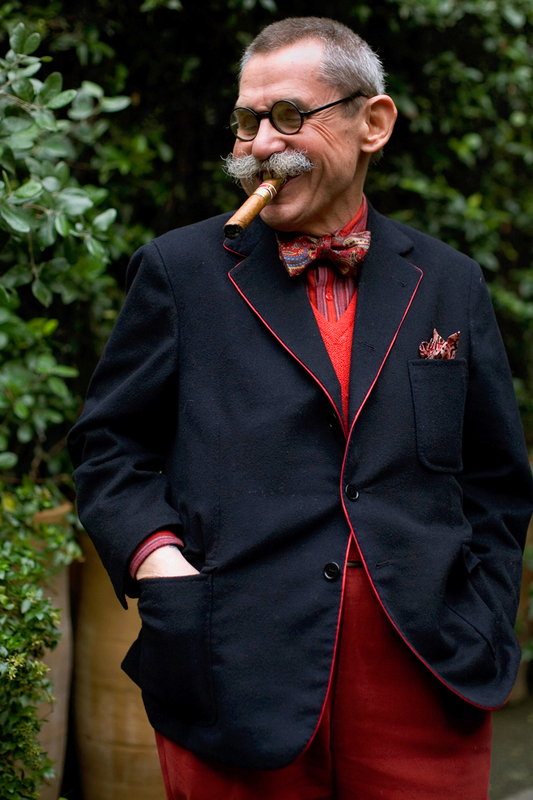 I love the reds he put together and the mustache, glasses and cigar just top off the overall style. This look would have been perfect if he had just a slightly larger cigar. Wow he is really fabulous, what a cheeky grin under a very impressive moustache. Loving the paisley bow tie and how his cigar goes with his outfit. Were would we be without you Sart? This guy is phenomenal. Coincidentally, I wonder what cigar he’s smoking? So camp, so cute, so free… I love his little outfit, is so him… Is great when people manage to express their personality and true self trough their appearance. True communication and joy of being in sink with others by just showing up yourself, is in my mind, the meaning of style. With help of this great picture I can see this man’s soul, I believe enlightenment can live in once choice of tie, Bravo! he reminds me of characters from alice in wonderland. I love this picture. It really is all about personality. I’ve never left a comment before, but this picture made me smile when I saw it. I agree with Moi, I would definitely like to sit down with this man for a drink and some people watching! If you presume to write fiction I would suggest you do it with greater panache. i think this might be my favorite photo. love that blazer. very cool. very circus barkerish. incredible sense of style and self-confidence. Don’t quite know where to start but i wanna know it all; as they used to say after a great party, “Let’s start with the gravel in the driveway”..speaking of that; what are the shoesw and socks ? Gotta have more orange/red going on down below. I love when your pictures celebrate eccentricity and not only fashion. Great piping! The match/blending of the paisley tie and striped shirt is wonderful. Those specs! The jacket! That tie! Red pants! Cool mix. i have been reading this blog for over a year, and this is the first photo i’ve commented on. absolutely delightful. i got 3 words to describe this look..
luv that color combination, very strong color to play with, but he pull it off….kudos..
this photo’s is going to be in fashionist list..
i agree with the others. one of the best. he outshines his cool outfit. he’s the uncle you wish you had… to tell you stories about his wild days way back when…. you took a picture of him before! i recognize his mustache, his glasses and the bow tie. he looks so dapper. His smile is just so infectious. You cannot help but smile with him. I love this outfit. Who knew one would be able to stomach so much red, let alone actually really like it. Bravo to the charmer. Love this. Wonderfully individual. Says to me ‘look I’m grabbing life by the nuts and so could you…if only you had this fantastic jacket’. approved! LOVE. If “The Sartorialist” didn’t include pictures like this, I wouldn’t bother to check the site anymore. I’m particularly captured by the juxtaposition of the manicured hair with the crazy out of control mustache. Beautiful man and picture. Too overdose of red as someelse stated; would have worked better witha a white shirt. The hair, glasses, mustache and cigar fit so well together. aside from the outfit (which is delighful! ), i must say bravo for the short-cropped hair. what a great stylistic choice, especially with the wild stache. the hair style has so much attitude; it’s clean and sharp and modern, rather than a more traditional side part or some such. and the glasses are superb. i’m such a fan of each style choice he’s made, and what a smile. consider me charmed! This gentleman is what fashion is all about!!!! He lets me know that there are men who are not afraid to indulge in color!!!! The way that the red comes together with the trim on the jacket is remarkable!!!! I tilt my Bowler Hat to Him Keep it FuZzY!!! Photos like this are what set your blog apart from the rest. You consistently demonstrate that true style is the matching of clothing with one’s personality, and not just the wearing of the latest trend. Love you for featuring men and women of all ages and types. This photo made my day. Thank you! can i have him, please? I don’t know…..is this guy a dandy or a cartoon? Not somebody I would be interested to get to know based on the clothes. Such a cute little man! I love him! I love how he mixed a striped shirt with a paisley bowtie. This photo is delightful. Oh my, this man is wonderful to look at. I have had this pic as my desktop wallpaper for the past few days and I feel great every time I sit down to do anything on my computer. He is an absolute delight to look at. He is the fun loving and crazy witted grandfather or uncle I never had. And for anyone that would not want to sit and have a drink or few with this cat, I don’t want to know you. he’s like that fun crazy uncle. very fun and playful with a face full of character, pulled it off marvelously with the cigar. Oh my goodness!Through this photo you just think, grand party at his house and I want to go!I am sure he has great stories to tell. Yes indeeed a fabulous,colorful character. no no no white shirt. how idiotic. how could anyone think a high-contrasting, staid, mismatched white shirt would be an upgrade?? the three patterns of the shirt (which i must say i love that stripe/colors), bowtie, and pocket make up the sophisticated, rich layering that takes this outfit away from costume, and adds interest to the color blocking of the red vest, pants, and navy (or is that black? i’m going with deep navy) jacket. he’d be a red-white-and-blue uncle sam/sailor with a white shirt. honestly!! I have a serious thing for quirky older men. This is my favorite Satorialist photo. Genuine style and so sweet. This old man has some good style that seems to portray his personality. I like the red piping on the coat that coordinates with the sweater and pants. It looks natural to his personality and not fake. The glasses, mustache, cigar and coordination bowtie/hanker chef are all wonderful complements of his style. Ahhhh….lovely. Would love to sit down and probe over a good glass of wine with this delighful man. His teeth..so big and yellow and his mustache,thick and prickly. Your photos actually do people justice. You get right into their soul. Thank you for finding your passion. Indeed, very charming, utterly mischievous … He look like he’s just winked at a pretty woman walking by and is sharing a laugh with her as she smiles appreciatively at the snappily dressed old gentleman who still has an eye for the ladies! This man runs my favourite restaurant in Milan called La Libera on Via Palermo. This outfit is conservative for him. He’s always smiling and has a twinkle in his eye.